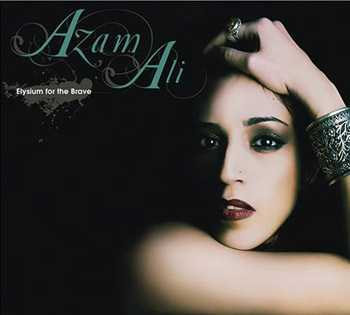 Azam Ali: "A glorious unforgettable instrument"
In a career which spans over a decade and includes eight collaborative albums and solo albums, Azam Ali has confirmed her place as one of the most prolific, versatile, and gifted singers on the world music stage today. Her dedication to defying cultural specificity in music, and her unwillingness to settle into one form of musical expression have earned her the respect of both her peers and critics worldwide. When one looks at her entire body of work, it is hard to deny Azam her rightful place among the best singers and composers in music today. Azam Ali, was born in Tehran, Iran and grew up in India from the age of four in the small town of Panchgani, a beautiful hill station in the state of Maharashtra. There she attended an international co-educational boarding school for eleven years, all the while absorbing India's rich music and culture throughout her formative years. The course Azam would eventually choose in her life would be very much influenced by her fortuitous upbringing in a school that emphasized the importance of the arts and spirituality, and aimed through moral and academic excellence, to produce promoters of social transformation imbued with the spirit of service to humanity. It is this objective that would take shape in Azam's music in the coming years. Shortly after moving to the United States, Azam fell in love with the Persian santour (hammered dulcimer) and it became clear to Azam that she wanted to pursue a career in music. Though she had an innate gift for singing since she was a child and sang often at home and school functions, Azam had no particular interest in becoming a vocalist. She had her heart set on becoming an instrumentalist and so began studying the santour under the guidance of Persian master Manoocher Sadeghi, During the eight years of her extensive studies with Ustad Sadeghi in which she became an accomplished hammered dulcimer player, Azam began to realize that she was unable to express the full range of emotions she experienced through her instrument. It was during one of these lessons that her teacher heard her sing for the first time. Completely taken, he told her that her voice had a rare emotional quality about it which should be cultivated and nurtured. It was through his encouragement that Azam began to explore her voice as the vehicle through which she would finally be able to fully express herself, a voice which Billboard magazine would later describe as, "a glorious unforgettable instrument." While pursuing formal training in various vocal traditions like Western classical, Indian, Persian, and Eastern European, Azam's true passion has been to explore the immense potential of the human voice, specifically its capability to transcend language, cultural, and spiritual barriers when expressing pure emotion. When asked about her approach to singing Azam explains, "What intrigues me most about the human voice is its ability to make all things transparent through its power of transformation. The voice is not just a conduit for words. For me it is like an abstract dream in which everything makes perfect sense." Currently living in Los Angeles, Azam is internationally recognized for her work with Vas, the critically acclaimed, best selling, world music duo she co-founded in 1996 with percussionist Greg Ellis. From 1997- 2004 Vas released four albums on the Narada label. Their music, which they described as "alternative world," focused mainly on the ancient relationship between the drum and voice. Their distinct cinematic sound blended influences of Indian, Persian, Western and other musical styles into a unique configuration that transcended categorization and cultural specificity. Though in their early days Vas drew many comparisons to Dead Can Dance, they patiently surpassed that comparison with each album they released, earning them their place in the musical hierarchy of bands whose innovation set a standard to which others to aspire. In 2002 Azam released her first self produced highly successful solo album, Portals of Grace, which featured her singing renditions of ancient Western European medieval songs. Billboard described this album by saying, "It's unlikely that this year will bring a more spellbinding vocal album than Portals of Grace." Azam's exceptional voice and emotive performances on this album earned her much critical acclaim and once and for all solidified her place as a highly respected singer in the World music scene. Her latest project, Niyaz, with Loga Ramin Torkian of Axiom of Choice, and two time Grammy nominee producer/remixer Carmen Rizzo released on Six Degrees Records, blends ancient Persian and Urdu Sufi poetry, rich acoustic instrumentation, and modern electronics. Their CD has been hailed by critics worldwide as one of the most groundbreaking of its time. The album debuted at ..1 on iTunes world music chart and remained there for numerous weeks, and it charted on Billboard's world music chart for four consecutive weeks, peaking at ..12. 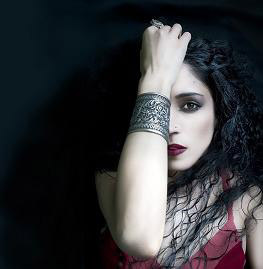 Niyaz also entered WMCE, the World Music Charts of Europe, at ..76 and was the only Iranian group whose CD made it into the top 150 of the best albums of 2005. Elysium for the Brave, Azam's second solo album, signals a new turn in her musical evolution. The album, her most ambitious work to date, brings together musicians from varied musical backgrounds performing in diverse permutations. Singing predominantly in English for the first time, the songs are based on lyrics written by Azam herself and reveal a poetic lyricism heard only in glimpses of her previous works. From the new CD's opening track, "Endless Reverie," it becomes immediately apparent that Ali has moved into new and exciting sonic territory. The frame drum pulse is familiar but the percolating synthesizer textures and haunting vocals sung in English take the song into a darkly beautiful place that exists between the worlds of electronic rock and global fusion. This fascinating terrain is also occupied by the tracks, "In Other Worlds," "In this Divide" and "Forty One Ways." While impeccable electronics and programming abound on Elysium for the Brave, they are balanced throughout the CD with traditional instrumentation. The gorgeous lafta and hand drums which propel "Spring Arrives" and the insistent ney flute which lends a haunting quality to "I Am a Stranger in this World" are brilliant examples of how organic and electronic instrumentation can beautifully co-exist. In fact, despite the mix of ancient and modern instrumentation, Elysium for the Brave is a highly coherent body of work that weaves together all of Azam's cultural and musical influences into a tapestry of atmospheric rock, electronic, and global sounds. Helping to seamlessly bring all of these diverse sounds together is a talented cast of musicians which includes King Crimson's rhythm section of Trey Gunn and Pat Mastellotto, Persian classical violinist Kiavash Nourai, and noted film composers Tyler Bates and Jeff Rona, the latter of whom is known for his collaborations with Dead Can Dance. Loga Ramin Torkian and Carmen Rizzo, Azam's collaborators in her latest musical venture, Niyaz, have also lent their talents to this project. Released on Six Degrees Records, Niyaz' debut blends ancient Persian and Urdu Sufi poetry, rich acoustic instrumentation, and modern electronics. Their CD has been hailed by critics worldwide as one of the most groundbreaking of its time. The album debuted at ..1 on iTunes world music chart and remained there for numerous weeks, and it charted on Billboard's world music chart for four consecutive weeks, peaking at ..12. 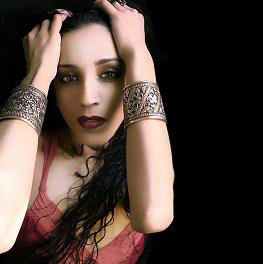 Niyaz also entered WMCE, the World Music Charts of Europe, at ..76 and was the only Iranian group whose CD made it into the top 150 of the best albums of 2005. "I am pertinacious in my need to expand. By nature, I am not one who can physically remain in one place for too long. I imagine that is the case because I have been transplanted enough times in my life that I am well aware of the influence the external environment has on the inner one, and how that can affect perception. So naturally, my music is going to reflect this inability to remain static, and this inability to identify myself with just one specific culture. I think of all the different music that I have done and will continue to do almost as photographs of my evolution, and just like photographs, in some I may look great and in some I may not. What matters to me is that I risk, I, trust, I strive, and let things unfold as they may." Azam's immense talent and ability to adapt her voice to any musical style have drawn the attention of many diverse artists and film composers. Azam has collaborated in the studio and on stage with numerous artists: Serj Tankian of System of a Down, The Crystal Method, Pat Mastellato and Trey Gunn of King Crimson, Dredg, Chris Vrenna formerly of Nine Inch Nails, Ben Watkins of Juno Reactor, Buckethead, Steve Stevens, film composer Tyler Bates, Mercan Dede, the world renowned Japanese group Kodo, Zakir Hussain, Omar Faruk Tekbilek, and Mickey Hart with whom she also toured for two years as a lead singer in his group Bembe Orisha. Azam's distinctive voice can also be heard on myriad film and television scores among which include "Matrix Revolutions," "Godsend," "Papparazi," the upcoming major motion picture 300, Children of Dune, Earthsea, Dawn of the Dead, Alias, and The Agency. Get your FREE download of Azam Ali's "In the Divide"